The month of May, we planned to visit in the Philippines. There is no fix date. I need to get a plane ticket today at IACE travel in front of the main gate. I will see if they are open today since it is holiday here in Japan. I decided to go home on August where Benjamin cannot skip to school. I planned to stay a month in Phil. So my parents can spent time longer with my two little ones. One week stay there is not enough anyways. This post is always on top because I update the date every time I made a post. You can click the link if you wanna read my write ups and can see photos too during our tours here in Japan. Thanks for viewing. You might like to read this Japan Travel Information and Tips. It helps in your trip here in Japan. April 2008: What are we doing this month? April 18, 2008. Benjamin come home happy from school. April 9, 2008, Benjamin's first day at school and he is so cute on his uniform. Few photos during the entrance ceremony at Seika Kindergarten School. April 7, 2008. Day 2. Tokyo Disneyland. I will share the photos and this is at the entrance of the park and they have different main street. It is covered by a roof. This is the beautiful view of the castle before the rain hit. Here are more snapshots and so we are wearing our ponchos..
April 6, 2008. We spent our day traveling to Tokyo and Disney Sea Resorts. 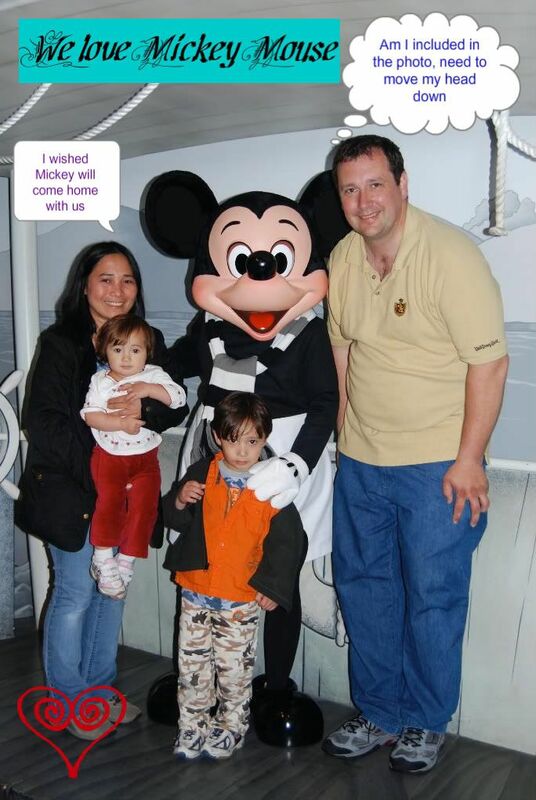 This was our photos when we travel to get to Mickey Mouse. You can also read our trip report here. Here's our photos at Disney Sea at the Mysterious Island and so the photos at Mermaid Lagoon. Brian did found a Hidden Mickey at Mira Costa Hotel. Can you find the Hidden Mickey in the photos? Brian and Ben was in line to ride in 20,000 leagues while Mary and I went to the baby center. Benjamin was scared of the dark and does not want to ride. I heard that there is a coming show at the Mediterranean harbor-the Legend of Mythica Show so I waited there until Mary slept. Brian and Benjamin went to the hotel. We were at Venice, you can see the canal. March 2008: What we up to? March 27, 2008, We finally attended our church service in Yokohama. It took us 2 hours to get there. View the photos I took here. March 26, 2008. We have a cherryblossoms viewing inside the Naval base in Yokosuka Japan. February 2008. What we are doing here in Japan. We just got here. February 21, 2008. First Day of our new HOME and we run some problems the propane heaters was not working. We don't heat to keep us warm and we could not cook food. Stove was powered by gas. February 20, 2008. The day we move in into our new home. Tips, let them take all the packing materials and card board boxes. It is hard to get rid off of all the cardboards.. read for more here. February 18, 2008. It is Holiday and we visited to Tom Murphy's house. February 17, 2008. Today is Sunday and plan to visit to Kamakura. Read more write ups here on how to get to Hase, Kamakura where the big Budhha in Japan. Photos here. Wednesday 02-13-2008- Quiet Day but it is windy in the outside today. It is a bad day for Brian, I hope he found his wallet. Maybe his wallet lost. Sunday - 02/10/2008. Pls look the narrow streets in Japan. 3rd Day at AOB Class - 02/07/2008 - We went for a house hunting and we ate crepes at Crepes House. Look at our photos. First Monday in Japan - 02/04/2008 We are pretty busy today and trying to get an ID. The day we left in Japan- 1/31/2008, Just read my write ups.